Last Saturday was my first time as the Principal Race Officer (PRO) of a sailboat race. I was a bit surprised to learn how demanding the job is. The feedback was positive. Participants seemed to be having fun. I certainly did. 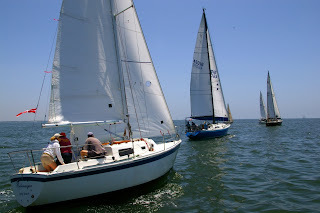 Sailboat racing is viewed by many as an oxymoron, especially racing at the local club level where a really fast boat may occasionally hit 8 or 9 knots. Most sail at the 5 to 7 knot range in a 12-15-knot wind. I’ve been racing sporadically since I bought my first sailing dinghy (Lehman 12) in 1965, in Denver. I read books from the Denver Public Library to learn how to sail it. There are sailboat races for every kind of boat, and at all economic levels. Our club sponsors what could be called “run what you brung” events, and people bring every thing from affordable, older boats of 25-feet and up, to the latest 40-something-foot racing-cruising boats. They are able to compete with each other through a handicap rating system. Racing your own sailboat has the same virtues of most kinds of competition. It makes you better at what you love to do. It imposes discipline. It provides a true measure of achievement. And it is fun. I learned a lot by being in charge of a race. I saw some expert maneuvers. I saw some flawless teamwork. I saw what not to do the next time I’m racing. And I saw all of that sitting on the cabin top of Narrow Escape, anchored in the waves to form one end of the start-finish line. It was unusually warm with light winds leading up to Saturday, and the marine weather forecast did not suggest much wind Saturday, either. But by 10 a.m. we already were measuring 6 knots from the south, and both the strength and direction held fairly consistent through the noon start for our series of three races for three separate classes of boats. Yacht racing is a highly-disciplined sport. It has a set of international rules, and an international jury to which a dispute, even at a minor local level such as ours, could theoretically be appealed. In most cases, races are conducted without any sort of refereeing or judging. The rules are enforced only by the participants themselves through the right to file a protest against another yacht. The race committee, of which I was chair, would have to hear the evidence, possibly view the damage, and render a binding judgment of right and wrong. There also is provision for a yacht in the wrong to tacitly admit it during the race and take a 360-degree penalty turn to wipe out the transgression. There were no protests in Saturday’s race. There are steps required to become the PRO for a race. First comes racing and serving on race committees. Then there is a day-long training course and test conducted under the auspices of US Sailing, which is the United States' member of the International Sailing Federation, and is the US Sailing Olympic Committee. Next was a race in which I served as the understudy to the PRO. Finally I got to be PRO, but with an experienced PRO aboard to coach me and keep things from becoming a complete shambles if I messed up. The most important job of the PRO is to define a good race course for the participants; a course that will be challenging, fun, long enough to justify the considerable effort in gathering crew members and preparing for a race, yet not so long that few are able to finish within the time allotted. In other words, you have to do a little short-term weather forecasting and predict what the wind will do during the afternoon conduct of the race. My race was midway along in a series of seven races called the Long Beach Harbor Invitational Series. Each event is run by one of the three local yacht clubs that created and sponsor the series. Saturday it was the turn of Little Ships Fleet Yacht Club, a seventy-year-old institution that can trace its history back through the beginning of modern-day handicap yacht racing. There were no two boats alike among the thirteen that competed. Instead, each had a handicap rating issued by an organization, Performance Handicap Racing Fleet of Southern California, that exists to rate the relative performance of sailboats. There were three start times, five minutes apart, one for each of the three classes. The finish time for each boat was recorded. Then the handicap rating was applied to their actual race times to calculate a corrected race time. The boat with the shortest corrected time in each class won that class. The system seems to work more or less fairly, and has done so for many years, and throughout the country, from all three coasts to the Great Lakes. Saturday’s course choices seemed to work. They ranged from 10.6 nautical miles for the fastest boats, to 6.6 nautical miles for the slowest. All the boats from all three classes finished with 35 minutes of each other. The boats took about 2 to 2.5 hours to complete their courses. Depending on boat complexity and the skipper’s preference, the boats raced with three to six-person crews. On the committee boat, we had a six-person crew and everyone was busy with assigned tasks from the time we reached the start area about an hour before the racing began, until all three races were underway. The failure of any one of the six to perform his or her task properly could create an unfair situation for the racers. Race postponement could be the outcome. But there were no failures. The wind held. The races started as scheduled. Then we relaxed, bobbed at the anchor, munched, read, talked, told tales, and waited to time the racers' finishes. Afterward, our arrival back at the dock and the eventual posting of the results and awarding of trophies was much anticipated. Hamburgers, chips, beer and sodas, kept the racers occupied long enough to run the finish times through the computer and print the results. I had never before realized that the PRO gets the last hamburger. If he’s lucky. I own "Narrow Escape", berthed in the Alamitos Bay Marina, Long Beach, CA. I'm retired after a 40-year career as a journalist, the last 30 years at the Los Angeles Times. I now work intermittently as a disaster public information specialist for FEMA.